AS someone who refuses to live in fantasy land, it became apparent, around 2012, that nothing would be done to stop Iran’s genocidal project. Effectively, matters become clearer for those who are well versed in geo-politics and Islamic related issues, assisting to navigate through what is always present: a smoke and mirrors show. 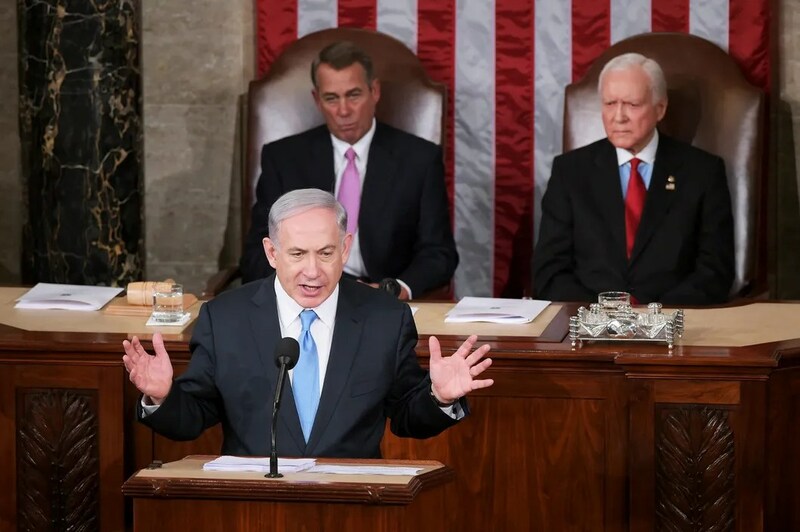 Even so, a flicker of hope intermittently did seep in, but only to be quickly extinguished with reality-based thinking: PM Netanyahu will NEVER muster the necessary mental fortitude, in order to defy HUSSEIN Obama and go it alone. Rather, he would shamefully rely on his oratorical flourish. He is a master of this domain. MORE specifically, upon completely acknowledging that HUSSEIN Obama would not be deterred from gifting Iran hegemonic status over the Mid East (for starters), the fact that anyone in their right mind (no pun intended) would waste precious time, attempting to convince him otherwise, is wholly irrational. PM Netanyahu, what say you?? AND this is where holding PM Netanyahu’s feet to the fire enters the fray, as he unequivocally imperiled the Jewish nation. No ifs, ands or buts, despite his high rhetoric, so-called “red lines”, and his embarrassing tough guy scowl. Israeli Prime Minister Netanyahu warns the United Nations General Assembly that Iran is close to build an atomic bomb. In the main, PM Netanyahu is best described as a “serial accommodator”, comparable to a badly battered wife who just can’t help herself from going back to her abuser, one last time, for more punishment. Now, others may tsk, tsk and opine: well, the POTUS is the big man in the arena, therefore, what can poor “Bibi” do but genuflect? Hogwash. In furtherance to the above charge and indictment, whereas PM Ben-Gurion took on the U.S. when Israel was little more than a military pipsqueak, PM Netanyahu behaves as if Israel is a vassal state. This is the case even though he has at his disposal the most adept forces in the region, let alone technologically advanced. Hence, the question is not one of actual force strength, but one of inner and moral fortitude. Hmm……. In the starkest of terms, one of my close counter terror contacts, Tom Trento, demonstrated said efficacy via: “Bomb Iran” – The Musical. Don’t be fooled by the title, the players within are beyond reproach. Deadly serious. They are TOPS in their respective fields – intelligence and military. MEMO to PM Netanyahu: way past time to stop talking and to give the order – bombs away! Don’t fall short by caving. Muster your courage. Otherwise, (Jewish) history will be very unforgiving….continue here…. NEVERTHELESS, this America-Israeli – now living in the eye of the storm – would be gravely remiss not to look outward, to some who possess serious heft, in order to amplify said exponential dangers. President Obama recently dubbed anyone against the Joint Comprehensive Plan of Action (JCPOA) Iranian agreement “crazies” — how very presidential. Such name-calling is just evidence that one doesn’t want to debate the issue and would rather revert to Saul Alinsky’s tried-and-true tactic of demonization and ridicule — it ain’t working. This is a serious issue, but Iran’s laughing all the way to the bank — literally. The ink was barely dry on a landmark agreement with Iran to limit its nuclear program before a German government plane packed with the nation’s economic elite touched down in Tehran. They were just the first in a rush of European ministers and businesspeople flocking to a market that is poised to reopen after years of grinding sanctions. Upscale Tehran hotels are packed and tables at trendy restaurants are scarce as foreigners jostle for bargains, even amid uncertainty over whether President Obama can overcome congressional opposition to the deal. The steady stream of visitors to Tehran is the latest sign of the Atlantic-wide divide between the United States and Europe, where there is scant opposition to the pact that aims to crimp Iran’s nuclear ambitions. Obama and Secretary of State John F. Kerry have warned detractors that they would be unable to reimpose a multinational trade embargo if Congress rejected the plans. The five other countries that helped broker the deal have also told Congress that they will not return to the negotiating table. The high-level trips show that U.S. leaders can’t even keep Europeans from booking tickets to Tehran ahead of the congressional vote, which needs to take place by Sept. 17. Interesting to note that it’s Germany rushing into Tehran to enable them to build their economy. In the 1930s, Chancellor Adolf Hitler spoke of restoring German pride after the embarrassment of World War I. Indeed, Hitler did this, by increasing production and manufacturing; improving road networks; and rebuilding the German economy destroyed under the Weimar Republic. And once Hitler had restored a sense of superiority in the German people, he had them. And once he had the the German people’s blind loyalty, he then transitioned to the next phase: military strength. This is exactly what the JCPOA has enabled. The first phase for Iran’s leaders is building the country’s economic strength. And when, by strategic design, the Ayatollahs have allowed enough economic improvement, the Iranian people will not remember their repressive nature. The Iranian people will become loyal followers — recall the massive rallies of 1930s Germany. Then the Ayatollahs will shift to their hegemonic designs. For Hitler, it was the creation of the Thousand-Year-Reich; for Iran, it’s the global Islamic caliphate. And just as Mussolini and others followed, so shall other nations see Iran as the strongman who stood up to America and Israel. They will see Iran as a powerhouse where European nations come and seek to establish economic trade and procure oil and gas. And all the while Iran will be building the tools of war. It will start with innocuous requests, responded to with appeasement and acquiescence. Then the requests will turn to demands. For Hitler, let us not forget, these included Rhineland, Sudetenland, Austria, Czechoslovakia, and then the blitzkrieg and Poland. And just Hitler had an ally in Josef Stalin’s Russia, Iran has one in Vladimir Putin’s Russia. Then, it was Japan in the Pacific; now, it is China. And instead of fascist Italy, Iran has Syria, Hezbollah and Hamas — and with their power and economic prowess will come other Islamic jihadists. Those who fail to learn from history are doomed to repeat it, and it’s playing out today just like it did last century. The recalcitrant lovers of peace who attacked Winston Churchill exist in a different form today — but the tactics are the same. Churchill was castigated as an alarmist and warmonger, but he proved to be spot on! Amazing, the world came together against apartheid and South Africa, but for some odd reason the number one state sponsor of Islamic terrorism — Iran — is cool. Siemens sent a top official to Tehran with German Vice Chancellor Sigmar Gabriel last month. Their government plane touched down at Imam Khomeini International Airport five days after world powers agreed on the nuclear deal on July 14. “The agreement reached between the E3+3 and Iran in Vienna has laid the foundations for a normalization of economic relations with Iran,” Gabriel said, using another term for the group of six world powers that negotiated the deal. The vice-chancellor was accompanied by a delegation of top officials from some of Germany’s largest companies, including Daimler, Volkswagen and ThyssenKrupp. Since Gabriel’s visit, high-ranking ministers from France and Italy also have visited Tehran. British Foreign Secretary Philip Hammond plans to rush there Saturday to reopen his nation’s embassy, amid concerns that British business is falling behind its continental counterparts. Spain, Sweden and Poland plan to follow in the fall. Most of the lawmakers have brought top business leaders with them. Next month, Austrian President Heinz Fischer plans to be the first European head of state to visit Tehran since 2004. Vienna also hosted a major E.U.-Iran trade conference just a week after the deal was signed. What’s at stake with the September vote in Congress on the JCPOA? Yes, it’s an historic event, launching us on the path to a replay of one of the darkest periods of history, World War II. The indicators and warnings are strikingly — and scarily — parallel. Who will history deem the “crazies” when all is said and done? Sadly, it will be Obama and his herd of followers. FOLKS reading these words (as well as those who aren’t, but may someday) who survive the oncoming onslaught, whether living in Israel or not, will ask themselves: How could we not have seen this coming? What, if anything, could we have done? Yes, don’t think that the U.S. isn’t in their TOP cross hairs…Israel is but a tiny pit stop for the Mahdi-driven mullahs. MOST significantly, if history is any guide, let’s be honest: countless stood callously aside in the run-up to the Holocaust. Some believed it had nothing to do with them, that it was “just” a Jewish problem. Others, Jews and non-Jews, thought it was better to stay quiet and not “incite” the Nazis to a larger onslaught! Truth dare be told, too many couldn’t wait to be rid of the “Jewish problem”, and nothing has changed. Hence, the dark resurgence of classical anti-semitism, even from “polite” society. AGAIN, those who refuse to see the historical parallels will rue the day. And not because this investigative journalist says so, but because of what the mullahs have in store. It will render the Holocaust little more than a small footnote. BESIDES, future generations will be much less forgiving, than anything that can be found at these pages. Count on it. TRENCHANTLY, this site queries fellow Americans: Did you vote for the most dangerous POTUS in American history? If so, you bear a certain onus, whether Jewish or not. (BTW, this has no bearing on party politics. Not at all.) Did you stay silent, even while there was still time to exert certain pressure points, to only awaken in time to go to a rally here and there when it no longer became tenable to sit on the sidelines? Did you contact Congress when force multipliers could have made their votes relevant, before deals were done and the issue was a fait accompli? And so on…. AS always, G-D will be the judge, whether one believes in Hashem, or the Father, the Son, and the Holy Spirit.